Thanks to a partnership with Promeco, we offer hydropulper units. 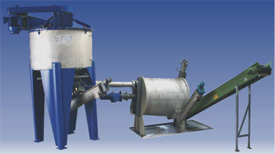 This equipment enables the separation of heterogeneous mixtures of residues containing two or more different products. The separation occurs when the products are diluted in water, involving a process with two distinct phases. The first phase occurs inside the hydropulper. The residues' organic fraction is diluted in water when mechanically stirred. 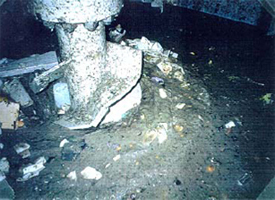 This operation disintegrates the organic fraction and disperses it in the water solution. In addition, a separation by gravity occurs thanks to the difference in density of the products in the hydropulper. Thus, the heavier materials (those whose density is greater than water) are separated through sedimentation. The diluted organic fraction and the light fraction (mainly plastics floating on the surface) are sent to a multi-separator, the second phase of the process. In this separator, the light fraction floating on the surface is mechanically removed thanks to screws. The residue fraction in suspension passes through a series of screens and is removed by a screw conveyor. The diluted organic fraction in the water settles with gravity and is then removed. This process is ideal for creating rich organic fraction for various re-use applications.